The X Factor is the most tweeted-about television series in the United Kingdom, generating almost twice as many tweets over a 12 month period as the runner-up, reveals new data. 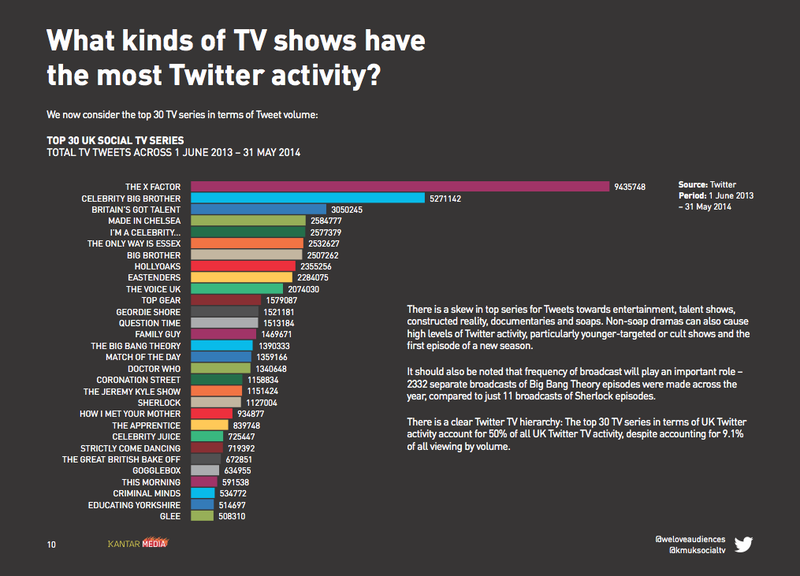 Kantar Media analysed more than 110 million TV-related tweets from over 13 million UK users between June 1, 2013 and May 31, 2014. The X Factor accounted for 9.4 million tweets over the year – about 8.6% of all TV tweets within that period, and 25% of all tweets in the weeks it was on air. Even if you’re not a fan of the show these are incredibly dominant numbers. Overall, however, and while perhaps not surprising, Kantar’s top 10 makes for rather depressing reading. The study also discovered that a Christmas Day screening of Love Actually was the UK’s most tweeted movie, while Doctor Who and Sherlock were the most popular dramas on Twitter.